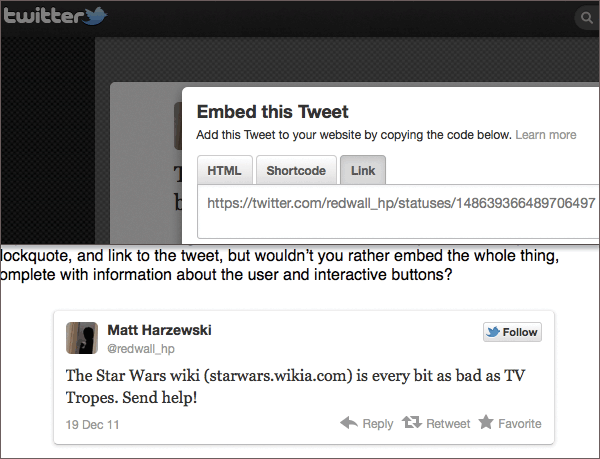 Have you ever wanted to embed an entire tweet into a WordPress post for some reason? Maybe you were doing a short write-up about a recent news story, and wanted to quote someone’s amusing tweet on the matter. You could just use a simple blockquote, and link to the tweet, but wouldn’t you rather embed the whole thing, complete with information about the user and interactive buttons? The Star Wars wiki (starwars.wikia.com) is every bit as bad as TV Tropes. Send help! The latest version of my Tweetable plugin, version 1.2.4, includes support for Twitter’s new embedding API, which enables you to do that with minimal effort. If you have the plugin installed (and “Auto-embeds” is turned on in the Media page of your Settings), you can just paste a properly-formatted URL from Twitter onto a new line in your post. After you hit Publish, it will appear in your post, thanks to the magic of oEmbed. The best part? This is going to be built-in to WordPress 3.4, so you have ensured forward-compatibility. Otto, one of the major contributors to the WordPress core, has already worked up a patch and it is currently slated to be included in version 3.4. Beat me to it. WooThemes recently announced the launch of their free WordPress e-commerce plugin, WooCommerce, along with a few themes with built-in integration. This is one of our biggest release to date and it’s absolutely free. WooCommerce is an all-new plugin application and library of integrated themes for WordPress that help individuals and businesses turn their sites into professional, e-commerce stores. Our aim for WooCommerce is to be an e-commerce toolkit that allows anyone to sell anything online. View the WooCommerce page to see all the powerful features packed into the plugin. WooCommerce is a fork of the lesser-known Jigoshop plugin, with a bunch of nice additions. This has been the cause of some controversy about the “ethics” behind the decision, despite it being 100% legal under the GPL. Personally, I can see merits to both sides of the argument, but I think it should encourage competition. The Jigoshop team should be able to absorb some of the improvements WooThemes made to their fork back into Jigoshop as well. I haven’t tried it out myself, but it seems like a good plugin. The code is very straightforward, too. It shouldn’t be too difficult to override the default stylesheet in favor of your own box styling, if you’re not a fan of the default. Jeff Starr (co-author of Digging into WordPress) has released a new WordPress plugin for allowing users to submit guest posts to your blog. User Submitted Posts lets users write posts and upload images through a form embeddable in any page or post using a shortcode. You can customize the fields shown a bit, the maximum number of images and their dimensions, things like that. The post state (draft, publish, or “publish after some number of approved posts”) is also configurable. Once a user has submitted a post, it’s saved as a “Draft” by default, but may optionally be set to “Publish Immediately” or even to publish if the author has “x” number of approved submissions. The plugin also displays a User Submitted Posts button at the top of the Posts Page that lets you filter all user-submitted posts/drafts with the click of a button. This seems like a great option for community-oriented blogs looking for a way to open up to guest submissions. I do wonder whether spam submissions might get to be a problem, though. It could be handy if the plugin could hook into the Akismet API or at least offer a CAPTCHA option.